If it is high performance you are seeking in your tires, then the Dunlop SP Sport Maxx tire is one you are going to want to check out. Not only does this tire deliver maximum performance on the street, but it also provides a surprisingly smooth and quiet ride as well. The tire itself features a silica enhanced tread compound with structured carbon black to give the tire superior grip and more responsive handling on wet or dry road surfaces. The aggressive directional tread design also has a continuous center rib and twin Hydro-Paddle ribs that work to evacuate more water from under the tire and reduce the risk of hydroplaning. Dunlop’s jointless band technology and twin steel belts give the tire added strength and stability at any speed, while the 5-block tread design reduces the noise and gives a more comfortable riding experience. Overall, the SP Sport Maxx is an excellent high performance tire that provides outstanding grip and steering response. Wet road traction is equally as impressive and the ride is just as nice. Dunlop has produced a very good model in the Sport Maxx. Prices on the Dunlop Sport Maxx range from a low of around $150 for the 16 inch series, to upwards of $500 for the much larger 21 inch tire models. Who Are Dunlop SP Sport Maxx Tires Designed For? Dunlop tires has designed the SP Sport Maxx tires for drivers of luxury and high end performance coupes and sedans who are looking for a serious high performance tire that provides predictable handling and performance on either wet or dry pavement. 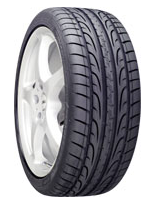 Dunlop does not provide for a treadlife guarantee on the SP Sport Maxx tire, which is common for this type of tire. They do however include a 6 months or first 2/32 inch of wear on the tire’s uniformity. You’ll also find a 6 year guarantee on materials and workmanship that calls for free tire replacement during the first year or the first 2/32 inch of wear. A prorated amount is given for the remaining time period all the way down to the last 2/32 inch of useable tread left on the tire.